Today's post is about some of the crazy brushes I have come across in my stash. First up is a bottle Bourjois with this seriously wide brush. It's meant to be a one second application, but I couldn't get the hang of this massive brush. 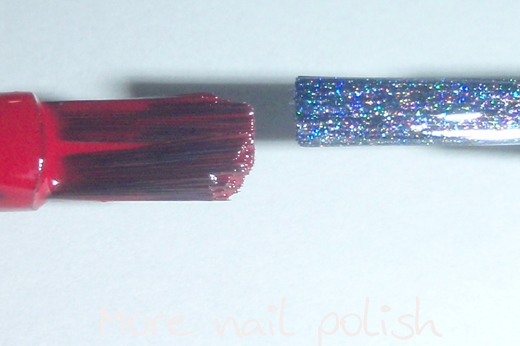 Just as a comparison, here is my OPI DS Glamour, with the OPI pro wide brush. See what I mean, that is one seriously wide load! Because its so wide it holds so much polish, which makes it hard to not get cuticle flooding. Next is a bottle of Stuf. That's Stuf. the brand, ok. It seems that this brush is a little too long for it's bottle, and therefore it curves at the bottom of the bottle. This is an old polish and it has obviously gone like this over time, but geez it really made it a PITA to apply polish neatly with this. You think you are lined up for a nice neat curve at your cuticle to find the brush kick to the side and smear polish down you skin. Next is a new polish. This is my bottle of Orly Lunar Eclipse. Half my bristles are snipped halfway down on a diagonal. This leaves me with only half the brushes to apply the polish and its really thin. Not a huge problem, but I thought I would include it. I makes you wonder what happened to this brush in the manufacturing process for it to end up like this. Finally, my favourite screwed up brush. This one is hilarious. Now those strands sticking up are actually caught in a split up the side of the wand. 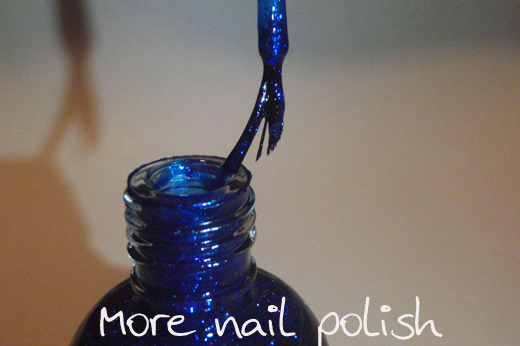 I couldn't believe my eyes when I opened this bottle, those strands flicked out and splashed polish across my table. This is another old Australia brand called Blush-amour. Evey time I open the bottle I think, I should cut these off, but I never have. I think its more fun this way. So how many defect or 'strange' brushes do you have in your collection? This is a funny and interesting post! I'll have to look through mine and see how my brushes look! I love this post, definitely so true how many defective brushes you get! Hey! I have a Nailene polish with the same wild hairs out to the side from a split in the wand! lol....same boat, I always mean to trim them, but never do! Haha! It's fun to see these photos. 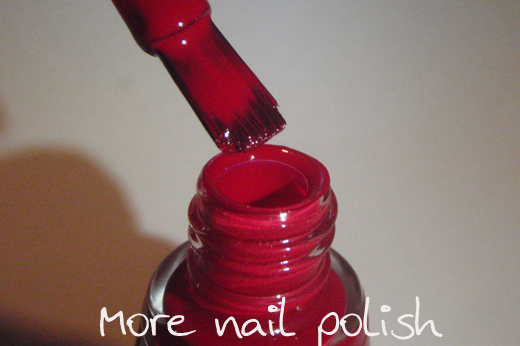 I've come across a messed up brush or two, and because of that, every time before I buy a bottle of polish, I open the bottle to check that the brush is fine. Of course, if I'm buying polish online I can't do this. Lol. 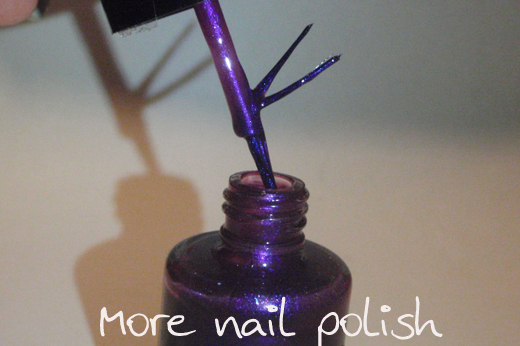 iv'e had my share of wonky brushes too.. i have a habit of saving a few old bottles of opi,orly,CG to swap out the stuff. 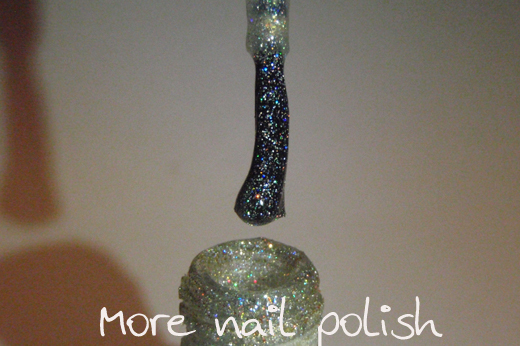 i really need it with golden rose brands ~love the polish ..hate the bottles & brushes. too bad on that orly i would send it back. What a fun post. I've come across some crazy brushes in my time too and I still never remember to check them before I buy. That last one is great-so much going on there! Wow, is really sad pay so much ($10) for a polish that comes with a messy brush (Orly) I mean, aren't we paying for a good quality product? I must be lucky! Mine are all rather healthy looking but I do have a pack of unused brushes just in case as I hate using a dodgy brush. I have plenty of liquid eyeliners and glitter eyeliners with busted brushes though and that's a nightmare! Oh man ... I wish I'd seen this before I headed to the shops today and came back with that exact same Bourjois bottle! The newest Bourjois range (10 day no chip) has a strange slanted brush which is designed to touch up your nails so the polish will last 10 days (false advertising in my opinion). The brush is awful to work with - Ive used it once and have no intention of using it ever again. This post is really funny. LOL...Everyone's responses are as funny as your original post!I love it and Great post! LOL this post is hilarious! I have a brush similar to your last one (the plastic is cracked and the bristles "rode" up) but I managed to get a replacement for it. LOL this post made my day! I couldn't stop laughing!! The last two brushes!! WTH happened to them? Lunar Eclipse LOL wth?